Wendy Red Star: Um-basax-bilua “Where They Make The Noise"
Wendy Red Star, Yakima Nation Youth Activities, 2014, slide of Crow Fair parade at Crow Agency in the 1970s, archival pigment print. 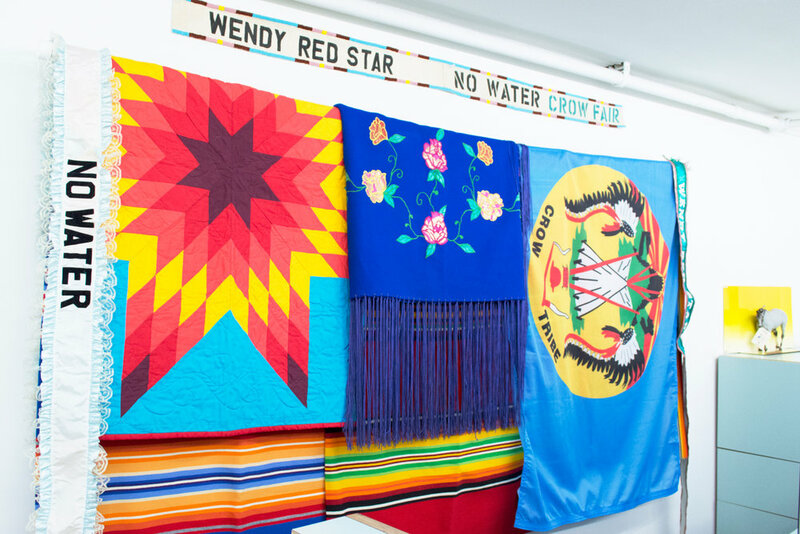 CUE Art Foundation is pleased to present a solo exhibition by Wendy Red Star, curated by Michelle Grabner. 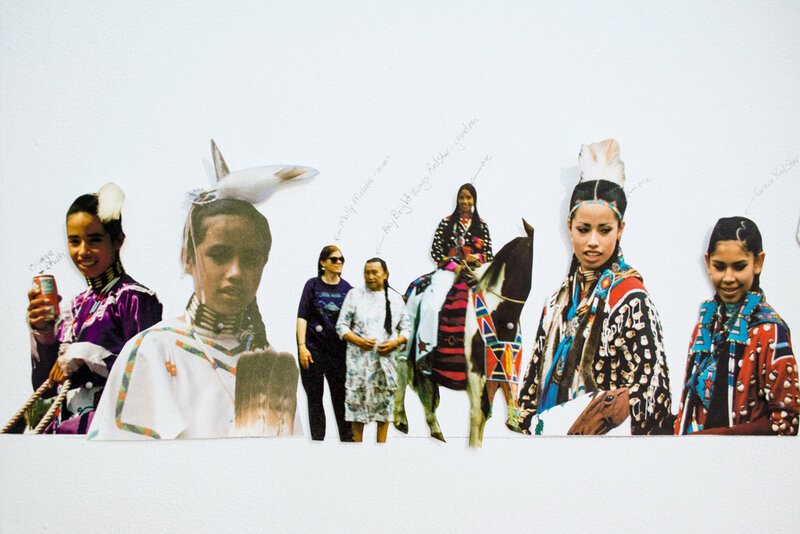 Titled Um-basax-bilua “Where They Make The Noise,” the exhibition features manipulated photographs, cultural artifacts, and video footage capturing the Crow Nation’s annual Crow Fair, held since 1904. The exhibition examines the cultural shift away from colonial modes of forced assimilation, documenting a government-sponsored county fair that has been re-appropriated as a vehicle for the revitalization of Apsáalooke (Crow) cultural ways. Every morning during an annual weeklong celebration, members of the Apsáalooke gather along the Little Bighorn River in Montana in a parade that expresses the deep-rooted cultural tradition of movement in Apsáalooke society. Families don traditional dress and display their horses during rituals that recall the migration from summer to winter camps. These parades pass on traditions from horse culture to car culture, from buffalo days to reservation life—weaving each generation into the fabric of a living, resilient tribal Nation. Red Star’s exhibition features found photographs and family snapshots arranged as a historical to present-day timeline of Crow Fair over the decades. She manipulates these images to isolate intimate moments, removing backgrounds to focus clearly on the subjects, the detail of their outfits, facial expressions, horses, and parade cars. 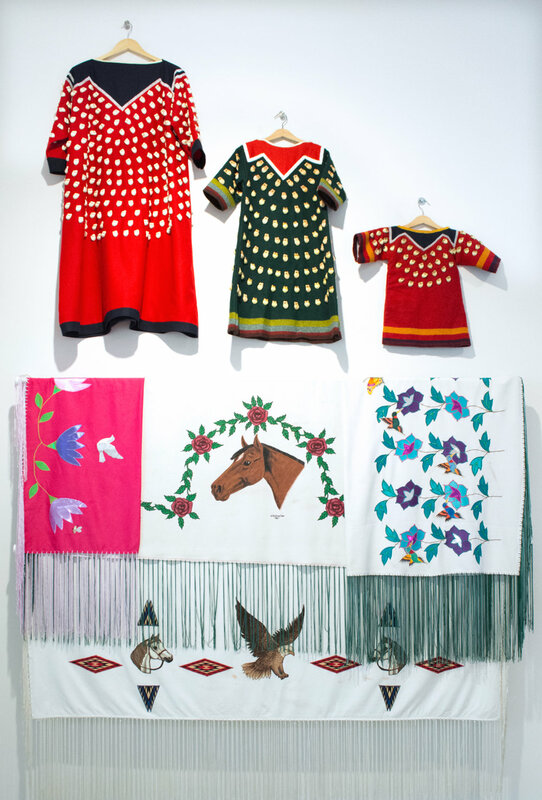 Accompanying these photographs, Red Star has arranged parade regalia—shawls, beadwork, elk tooth dresses, and blankets—handmade by her relatives and other Crow tribe members. Once draped on horses, cars, or the arms of Apsáalooke women and girls, each shawl shows signs of wear from many journeys around the camp. Sweat stains from horses and grass stains from playful children offer insights into the utilitarian beauty of these objects. Video footage of the Crow Fair shot by tourists and Apsáalooke from the 1970s to 2016 captures the sounds of horse hooves hitting pavement, gossiping parade goers, and the rhythmic jingle of bells as Crow men dance. 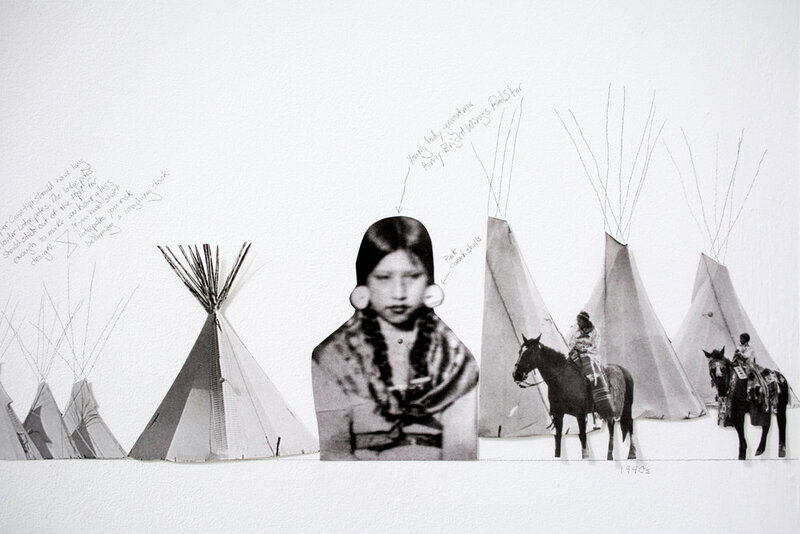 Wendy Red Star works across disciplines to explore the intersection of Native American ideologies and colonialist structures, in the past and in contemporary society. 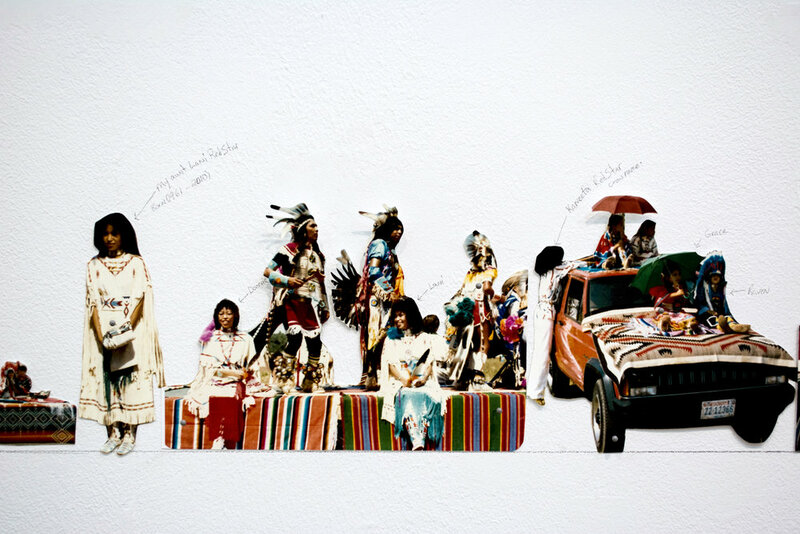 Raised on the Apsáalooke (Crow) reservation in Montana, Red Star’s work is informed both by her cultural heritage and her engagement with photography, sculpture, video, fiber art, and performance. An avid researcher of archives and historical narratives, Red Star seeks to incorporate and recast her research, offering new and unexpected perspectives in work that are both witty and unsettling. 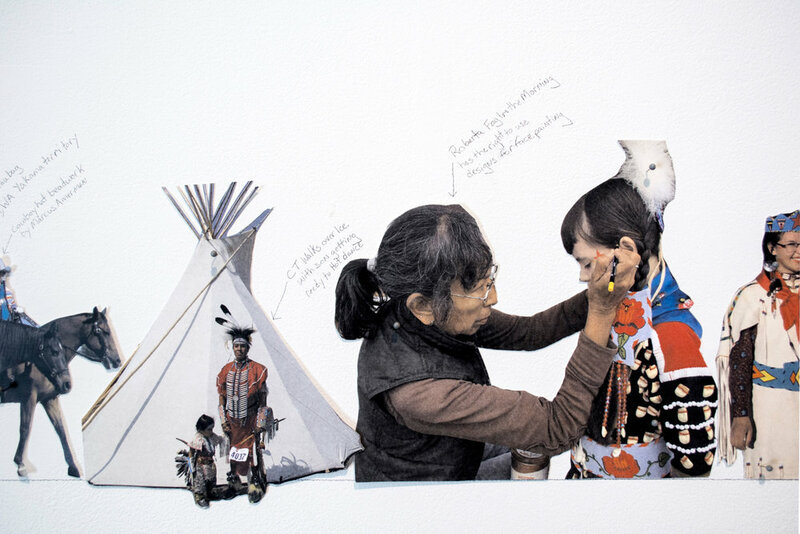 Her practice also centers on intergenerational collaborative work, which creates a forum for the expression of Native women’s voices in contemporary art. Red Star holds a BFA from Montana State University, Bozeman, and an MFA in sculpture from University of California, Los Angeles. She lives and works in Portland, OR. She has exhibited in the United States and abroad at venues including the Metropolitan Museum of Art, Fondation Cartier pour l’ Art Contemporain, Domaine de Kerguéhennec, the Portland Art Museum, the Hood Art Museum, the St. Louis Art Museum, and the Minneapolis Institute of Art, among others. She has served as a visiting lecturer at Yale University, the Figge Art Museum, the Banff Centre, National Gallery of Victoria in Melbourne, Dartmouth College, CalArts, Flagler College, Fairhaven College, and I.D.E.A. Space in Colorado Springs. In 2015, Red Star was awarded an Emerging Artist Grant from the Joan Mitchell Foundation. In 2016, she participated in Contemporary Native Photographers and the Edward Curtis Legacy at the Portland Art Museum, and recently mounted a solo exhibition as part of the museum’s APEX series. This exhibition marks Red Star’s first solo show in New York City. Michelle Grabner is an artist, a writer, and a curator based in Wisconsin. She is the Crown Family Professor of Art at the School of the Art Institute of Chicago where she has taught for twenty years. In addition, Grabner has also had teaching appointments at The University of Wisconsin, Madison; Cranbrook Academy of Art; Yale Norfolk; Milton Avery Graduate School of Arts at Bard College; Yale University School of Art; and Skowhegan School of Painting and Sculpture, Maine. Grabner co-curated the 2014 Whitney Biennial and curated the 2016 Portland Biennial. She is co-artistic director for FRONT International – Cleveland Triennial for Contemporary Art to launch in 2018. Her reviews are regularly published in X-tra and Artforum. In 2010, Mary Jane Jacob and Grabner co-edited THE STUDIO READER, published by the University of Chicago Press. Grabner is represented by James Cohan Gallery in NYC; Green Gallery, Milwaukee; Gallery 16, San Francisco; Rocket Gallery, London; and Anne Mosseri-Marlio Galerie, Basel. With her husband, Brad Killam, Grabner founded The Suburban in 1999 in Oak Park, Illinois, hosting a range of international contemporary art projects. 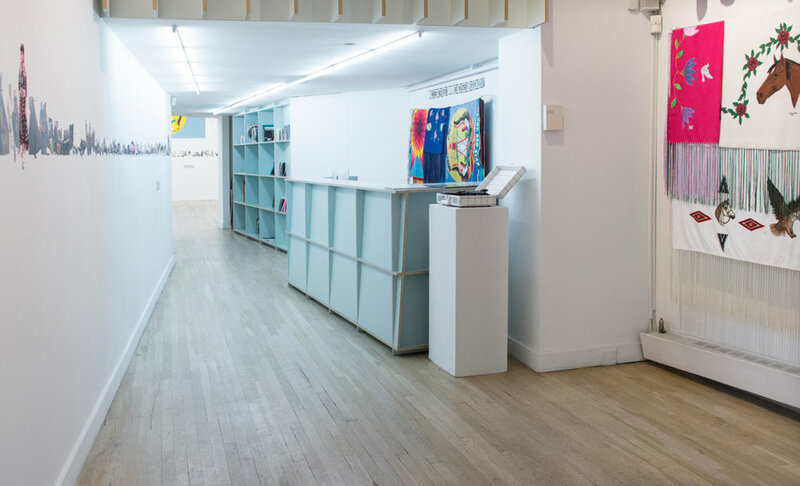 After sixteen years in the Chicago vicinity, The Suburban began programming exhibitions in two storefronts located in Milwaukee, Wisconsin. In 2009 Grabner and Killam opened The Poor Farm in rural Wisconsin. The Poor Farm is dedicated to annual historical and contemporary exhibitions, lectures, performances, publications, screenings, and alternative free pedagogical programs. The exhibition is accompanied by a 32-page color catalogue, with texts by Wendy Red Star, Michelle Grabner, and Josephine Zarkovich. The catalogue is available online, and free of charge to gallery visitors. For more information please contact Programs Director Shona Masarin-Hurst at shona@cueartfoundation.org.